Layla Grayce is offering a discount of 15% off on Valentine's Day gifts through the end of the month! 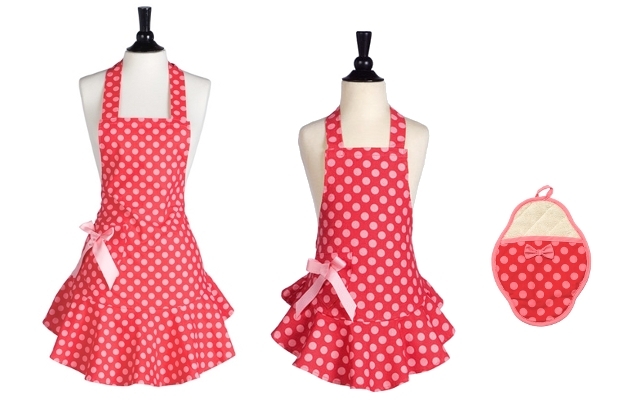 I found these Jessie Steele Josephine Red & Pink Polka Dot Aprons for mother and daughter already on sale. The adult apron will be just $20.40 (Reg. $32) and the child's apron will be just $12.75 (Reg. $20) with the extra 15% off. To take advantage of this deal, you will need to use the Layla Grayce promo code: 15pink by 1/31. The two aprons are marked down as final sale items. The matching Jessie Steel Pot Mitt is also available.